Recently, I read an article showcasing the results of a very interesting study conducted in Germany with both physicians and patients. 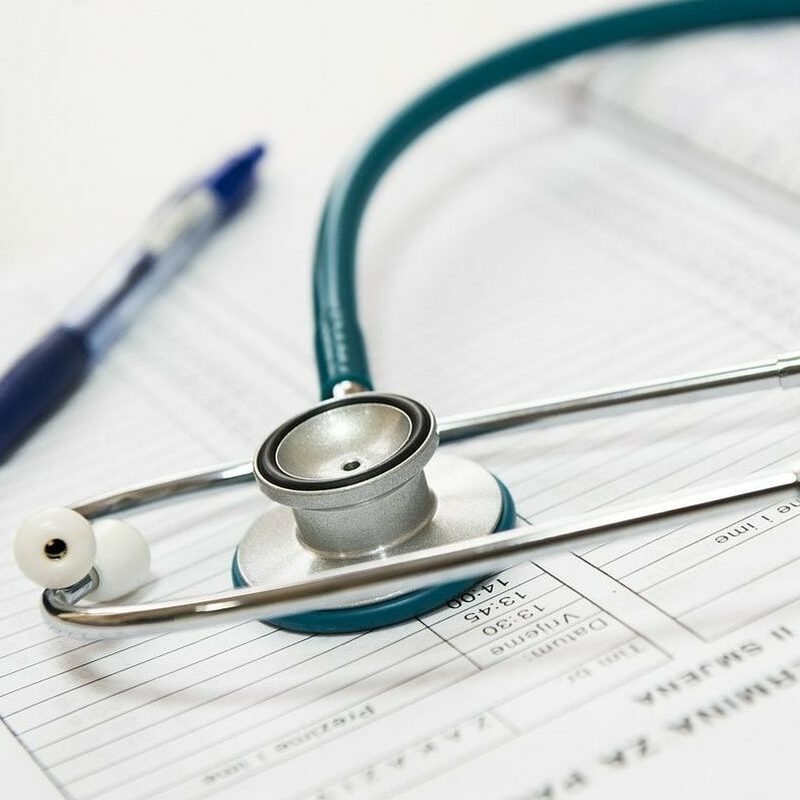 The study compares what patients want and expect from their healthcare providers and how well both the patients and physicians felt the patient’s needs were met. The results spoke clearly that patients want something more and different than what healthcare providers typically offer — not a big surprise. The study showed, too, that healthcare providers want to offer significantly more than they are able to but have limitations within the restrictive systems they are required to operate in. In one region, surveys noted that physicians were in despair about their jobs, with little hope that things might change. Many had “inwardly resigned” to the stress of their jobs. When that region overhauled the local emergency care system, not only did patient complaints decrease to nearly zero, costs also fell — ambulance usage declined, overnight emergency room visits lessened, requiring less around-the-clock staffing — all while neighboring regions saw a rise in usage of the system. What changed? The doctor-patient relationship was re-invented. This key relationship, which has eroded steadily as healthcare systems have come under growing stress, represents a lever for future change, both for quality care and for maintaining the vigor of the medical profession. A patient-physician forum was established to bring users and providers of the system together to enable the system to “see itself”. What emerged is that doctors considered the weakest link in the broken system to be their relationships with patients. Together, the interviews revealed there are four levels of patient-physician relationship and that all four levels are necessary and each is appropriate in different circumstances. You’ll see from the figure that levels I and II incorporate paperwork and routine procedures. Higher care care in levels III and IV consider both the physical health needs as well as the psychology of the patient — for example, helping elderly people feel safe. 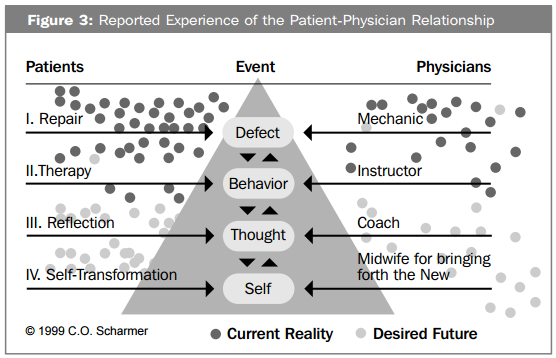 The reality of the situation showed that the current system was operating at levels I and II and both patients and physicians wanted to relate to one another at levels III and IV — where the physician and the patient work together to reflect, coach, transform, and bring in the new for the patient’s desired future. I found this study and article to be so relevant to how essential chiropractic care is in our own healthcare strategy and the importance of this care to be available in our community’s healthcare resources. A chiropractor has more opportunity than just about any other healthcare provider to truly join with their patients in preventive care, repair, patient reflection, and self-transformation. The chiropractor and staff have so many different methods of helping patients get and stay as healthy as possible without the use of harsh drugs and invasive procedures. At Collins Chiropractic, we want to be your coach — to inspire you to take good care of yourself now, before you’re faced with a medical crisis, and to continue to practice a high level of self-care as you move through your years with ease. Fish Oil and Vitamin D Now Available! Preventive Care vs. Crisis Care — What You Don’t DO Could Hurt You!